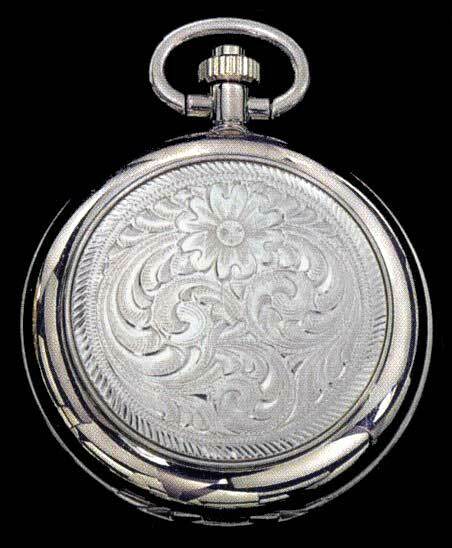 Fully engraved silver pocket watch with chain by Montana Silversmiths. Black numerals are displayed against a white dial. This pocket watch's electronic quartz movement is manufactured by Citizen and comes with a 2-year limited warranty. Everyone who orders these pocket watches loves 'em! Ships 1 - 14 days. 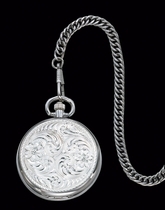 >Click here< to view the chain which is included with this pocket watch.